Artificial intelligence (AI) is a growing topic of popularity in the tech industry and in many people’s daily lives. What are the benefits of these changes? For the past few years, AI has slowly been working its way into being a household topic and put into more use in businesses. Companies ranging from General Electric to Spotify use AI for predictive analytics, data insights, and even more physical tasks such as machine maintenance to better control safety. Companies like Microsoft have been slowly and quietly building intelligence into their products for a long time—anyone who uses the Office 365 product suite or Skype will recognize these features upon closer inspection. Though many of the concerns around AI lie with the fact that workers are worried their jobs will be automated and they will be out of work, in reality, AI helps users work faster and smarter, moving from a more administrative role to be able to focus on strategy and technique. For example, incorporating AI into a contract lifecycle management platform allows contract creation to be accelerated as details can be auto-populated, as well as analyzed faster, as more can be quickly extracted. 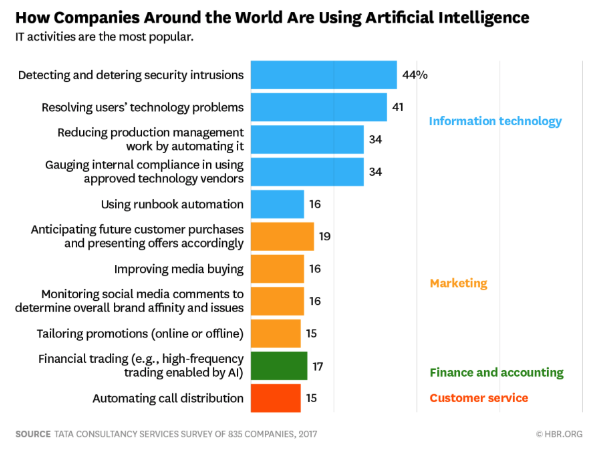 The chart below highlights how companies use AI, with the focus not being the elimination of jobs, but removing mundane tasks or time-consuming research in projects. Even a quick web search shows two different sides of AI. One is the innovation, excitement, and hype, with customization and a personalized experience being advertised as an all-time high and the ultimate benefit. The other is a warning: leaders in the community calling for regulations, companies trying to warn users and other businesses that they are still early in their AI experience, and as mentioned above, the ever-common concern that robots are going to eliminate the need for a certain job. Yet with both the positive and negatives in consideration, AI is also working towards creating more good in the world. Facebook, for example, has been using AI for years to help blind users have a more holistic experience on their app. Facial recognition technology is something they started back in 2010, something that users have become so used to many would not even pinpoint it as AI, but simply another feature of the app. Siri and other phone assistants have made driving much safer through their verbal commands, and Waze has made it easier to reduce commute time and avoid accidents and roadblocks. AI is also influencing healthcare. Last week we looked at how technology is beginning to revolutionize the industry, and AI is becoming more and more a part of that. A sector of Microsoft’s business is now focused on AI that can predict medical problems and help diagnose illnesses faster than ever before. With the full use of AI in the medical profession, limited resources and delayed treatments could be a thing of the past. Even though AI has been a part of business tools for many years now, in many ways it is still in the early stages of use. Leaders and researchers throughout the AI industry insist that AI cannot even compare to what a child could do in regards to more general tasks. Most people now have seen Google’s DeepMind AI that taught itself to walk—if it can even be called that—and recognize that there are still many unknown ways this tool can be utilized. The future of technology is here. Nearly everyone, whether they are aware of it or not, are currently using some sort of AI in their day-to-day lives. Even if the intelligence still has much to learn, the discoveries that have been made are incredible. As business continues to move faster into the future, the next step is for the community to recognize, acknowledge, and fully embrace how AI can transform the way people work.